The desert regions of southern Arizona, including Phoenix, have long been known as having a favorable climate for growing many different kinds of citrus trees, including lemons. The mix of extremely warm summers and cool winters causes the citrus fruits to be extra flavorful and complex, both tart and sweet. Citrus remains an important cash crop in the state. Citrus trees are also grown in many residential yards both for decorative purposes and for the fruit they produce. Choose the right time to plant. The very end of summer or early fall is a good time. The worst of the summer heat is over, but the young tree will have sufficient time to establish a healthy root system before the summer heat comes back around again. Plant the tree with care. Make sure the hole is big enough, two times the size of the root ball so you can mix compost into the soil as you plant the tree. Dig down to a depth of at minimum 3 feet. Make sure the tree is set down deep enough so the root ball is not exposed, which will dry it out. Desert soils often have the hardened mineral calcium carbonate, known as caliche, which presents a barrier for plant roots. When planting a lemon tree, it may be necessary to drive a hole through the caliche with a pick axe or jackhammer. Connect the tree to an irrigation system. After setting the tree in the ground, form a basin around it for irrigation. Locate the emitter or bubbler on the edge of the basin, and let the emitter run for 45 minutes to an hour. Filling the basin allows the water to penetrate deep into the soil, so the plant roots eventually go down deep as well. In the summer, water the tree once a week; in winter once-a-month watering should be sufficient. Fertilize the tree. In the warmer deserts, the growing season begins in early to mid-February. Lemon trees can be fertilized at that time, and blossoms will appear in March. Use a fertilizer specifically formulated for citrus trees. Some growers recommend additional fertilizer be applied again in late spring and then at the end of summer. 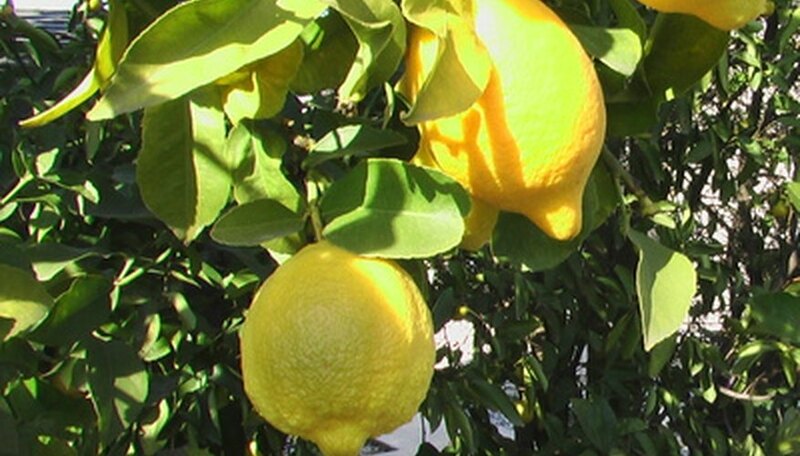 Choose a lemon tree grown on rootstock that does well in Arizona's soil conditions. Citrus trees are grown by grafting a select variety on top of a rootstock variety. In Arizona, the sour orange rootstock works better than the sweet orange. Local growers know this and propagate the trees they sell to consumers accordingly. If you see rootstock branches popping out below the graft line, trim them so they do not grow up into the tree canopy. Lemon trees are among the citrus varieties that are most sensitive to cold, so they must be protected when there is a danger of frost. Even the lower desert areas get a few nights of below-freezing temperatures each winter. Young lemon trees are particularly vulnerable to frost damage. Lemon trees need to be covered overnight with porous material such as sheets or burlap, or cloth especially designed for protecting plants from frost, available at hardware or home supply stores. Extreme heat can also cause stress for lemon trees. One solution is to paint the trunk of the tree so the direct sun is reflected, using diluted white latex paint. Locating the tree so it is shaded from part of the hot afternoon summer sun is also a good idea.